Josie Rourke’s Mary Queen of Scots in many ways tells the story of two queens—the title monarch (played by Saoirse Ronan) and Queen Elizabeth I (Margot Robbie)—and their different kingdoms. In Scotland, the young Mary fights to make her nation independent from the infighting of its male nobles and England’s domineering influence from outside. In London, Elizabeth, much in awe of her spirited cousin, masterfully steers past court intrigues and petty treacheries to maintain her power. To showcase these different worlds and the women who ruled them, Rourke reached out to production designer James Merifield. Having previously worked on noted period pieces like the BBC’s Sense & Sensibility and Little Dorrit as well as having designed the epic settings for large opera and theater houses, Marifield intuitively understood how to infuse historical events with dramatic grandeur. We spoke with Merifield about his inspiration for Mary’s stunning home, how Scotland’s dramatic landscape influenced his sets, and how he defined each queen architecturally. 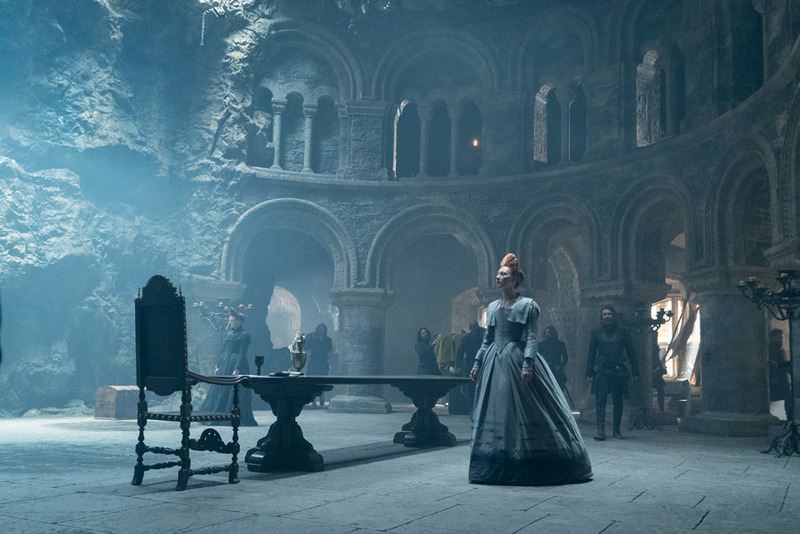 What was your biggest creative challenge in creating the production design for Mary Queen of Scots? Finding a way to tell this story visually. The two queens inhabit two different worlds, which are continually intercut throughout the film. We needed to create two very distinctive visual spaces for them. On one of the very first scouts I did with Josie where we visited Blackness Castle I got the inspiration for Mary’s space. Seeing how the walls of the castle there organically grew out of the natural rock led me to tell Josie, “We’ve found our Holyrood.” Blackness Castle inspired how we constructed Holyrood’s interior. I became obsessed with the set growing out of the rock. Initially when Mary arrives home [from France] it is almost like the bat cave. There is a wall of rock so that one could almost climb up it. Mary’s world was created as a very natural, organic space which would be opposed to the very formal, regular, symmetrical, highly gothic world of Elizabeth. How did you come up with the look for Elizabeth’s world? Our inspiration for Elizabeth grew out of the gothic look of Gloucester Cathedral. You see it at the beginning when Elizabeth comes out of her bed chamber into the long, high vaulted corridor. I wanted to infuse this gothic look into the sets we built for her bed chamber. You see a high, vaulted ceiling space. As the film juxtaposes these two spaces [Mary’s Holyrood Castle in Scotland and Elizabeth’s Hampton Court in London], you immediately can recognize the different worlds as you cut from Scotland to London. In doing your research, did you base your designs on actual buildings? Yes and no. Although my designs were taken from actual references, the worlds I created were fictional. When I started out, many of our references were modern. When I went to meet Josie for the very first time after having read the script, I had very contemporary images. There were two very distinctive images of girls looking into a mirror. Here are our two queens, two very vulnerable women controlled by this hierarchy of very strong, powerful men. I saw these two women as looking into this mirror as if each was a reflection of the other. That sensibility informed the designs. It was very important that the bedchambers where the women lived was where much of the action occurs. It was a place where both women could escape to and be themselves with their chambermaids. Josie and I thought of Mary’s bedchamber as a sort of girl’s sleepover. And it was historically correct that the queens would never have slept alone. Their maids would have kept them company. We had futons on the floor with lots of cushions and bed pillows on which to recline, sleep, play cards, or listen to music. You’ve worked on a lot of period pieces. When does the research stop and the creative interpretation begin? I like working on period pieces because I get to create entire worlds. I start with research, using historical and coffee-table books to source my ideas, but then I have to put them away. We are not making a documentary. We are here to serve the story, in this case the story of two women who happen to have been queens. I try not to get too immersed in historical accuracy. Having done a number of period films, I feel confident enough take broader brush strokes that may not be exact but the overall feel of what ends up on camera is believable and right for the story. 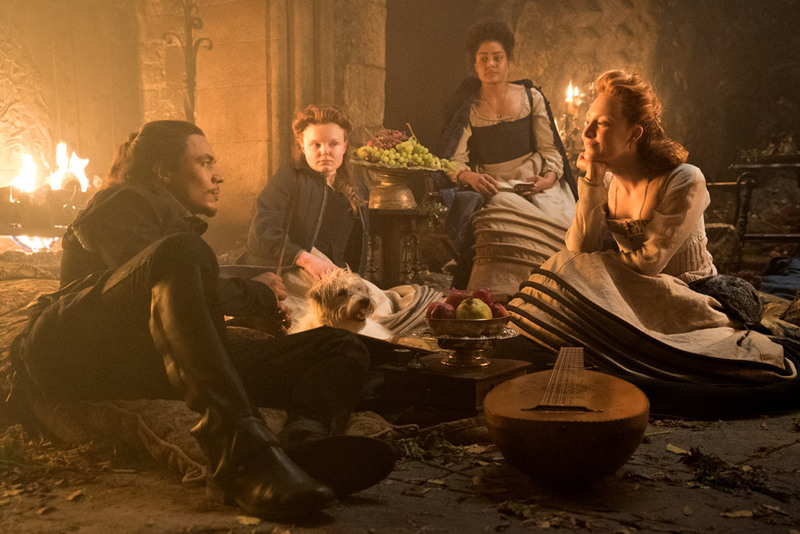 How did your work in opera and theater help create dramatic spaces in Mary Queen of Scots? Having done theater gave me an immediate connection with Josie, who is the artistic director of the Donmar Warehouse theater. But having worked in big opera houses and large outdoor theater spaces helped with the scale of the sets. The main space of Holyrood was designed as a theater set in many ways. We put a giant tapestry on a circular track and added some very large screens throughout. By doing that we created a circle within the main space which doubles and triples throughout the film as where the marriage happens, the masque ball occurs, the picnic sequence takes place, etc. All these different things happen in that space. And just as with theater, by adding a single element, you allow an audience to believe they are in another space. How did you break up the spaces to define the different areas dramatically? In the grand hall, we made this circular core where Mary would be framed by a tapestry of Adam and Eve—which is very symbolic—and the men would be framed by very large, hard screens. In one space, you have the male and the female worlds intertwining. Elizabeth’s court was shot on location at Divinity School, Oxford. I placed a rood screen in the middle of her location with its high, vaulted gothic ceilings. The rood screen, which was made up of all these carved details, was my way of having her appear framed within a frame within this screen. The screen divided the court from all the ladies in waiting. I like to think that my sets, although they are bold and theatrical, are true to the storytelling and work to enhance other elements, like Alexandra Byrne’s stunning costumes. The film has stunning exterior shots of Scotland. How did these grand landscapes inform your production design? I used to tell our DP John Mathieson and Josie, these landscapes are free. Sure, you have to trudge through the rain and wind to get up there, but once there, it’s spectacular. That shot where Mary and Darnley (Jack Lowden) are up there on their horses is breathtaking. 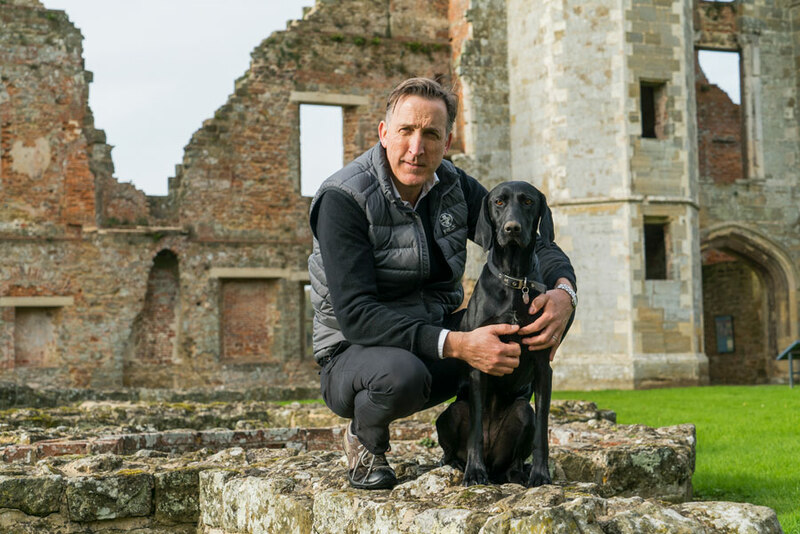 Because the scale and majesty of the landscape is so significant it was very important that I did not shy away from scale and majesty within the interiors too. In connecting the interior to the landscapes, we were really helped by sound. The castle was built on a stage with windows as old-fashion, painted backdrops of the highlands and the mountains. But with the sound of wind blowing outside, you get this sense of this space being on top of the world as well very cold and very damp. I loved that we could easily cut between beautiful, breathtaking landscapes and the interiors that seem to grow out of the landscape, out of the rock.